Changeworks vision is that everyone we work with is able and inspired to take action that benefits people and the environment. We deliver solutions that enable people to live and work more sustainably. We are an environmental charity and social enterprise that works with people, communities and organisations to; Inspire and enable action to reduce CO2, waste and fuel poverty, Build confidence and skills to make sustainable choices, Share our knowledge and learn from others to maximise our impact, Deliver t .. In total 3 links were found which refer to Changeworks.org.uk. The most important link sources for this website are Stopclimatechaos.org and Islandsgoinggreen.org. The homepage of Changeworks.org.uk and the subsite are most referenced by other websites. The table shows the most important links to Changeworks.org.uk. The table is sorted in descending order by importance. The table shows websites of Changeworks.org.uk, which are often linked by other websites and therefore they are classified as important content. three profiles were found for Changeworks.org.uk in social networks. Among other social networks the website is represented in Facebook, Twitter and LinkedIn. 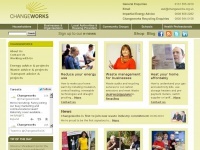 The web server used by Changeworks.org.uk is run by UKfastnet Ltd and located in Great Britain. 15 other websites are located on this web server. Most of them are provided in the english language.